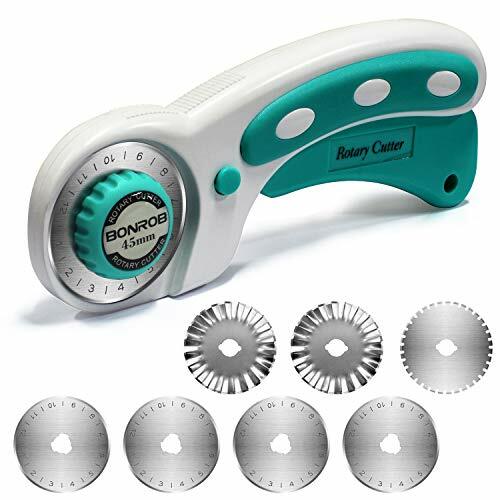 45mm rotary cutter is ideal for arts and crafts projects such as sewing, quilting, fabric cutting, paper cutting, leather cutting and other DIY projects! Features: 1. Made of SKS-7 steel - sharp & hardly dull 2. Rotary cutter tool designed with safety button 3. Handy handle - Ergonomically designed anti-slide & to reduce joint Fatigue 4. Suitable for right-handed & Left-handed users package Included: 45mm rotary cutter x 1 6 x Replacement blades for straight line cutting; 2 for curve cutting; 1 for dotted line cutting) Use tips: 1. Sharp blade, please be careful to use, do not put in place where children can reach. 2. If the long-term not in use, Please drop some of the oil in the blade head to increase of service life. 3. The use cycle of consumables, due to different personal use habits lead to different usage periods. 4. When not use, Please Pack the cutter head and open it when you use it. Note: The maximum thickness is 5mm. Safe - Your safety is our top priority. The rotary cutter is designed with a safety button to lock the blade. Also the blades can be installed on both side of the rotary cutter, perfect for both right- and left-handed users. Precise: The 45mm blades are made of SKS-7 steel, sharp and hardly dull. With different replacement blades, you can cut multiple layers of fabric, paper or other materials precisely with the help of sewing cutters. Variable: fits for all 45mm rotary cutter, The blades rotary cutter with anti-slide handle is ergonomically designed to reduce joint Fatigue. Guarantee: If you are unsatisfied with this product for any reason, Please just let us know and we will refund your purchase right away. Warranty: Guarantee: If you are unsatisfied with this product for any reason, please just let us know and we will refund your purchase right away. Turning and facing tools can be locked together (saving time and labor when changing operations). Shipping weight- 1 lb. 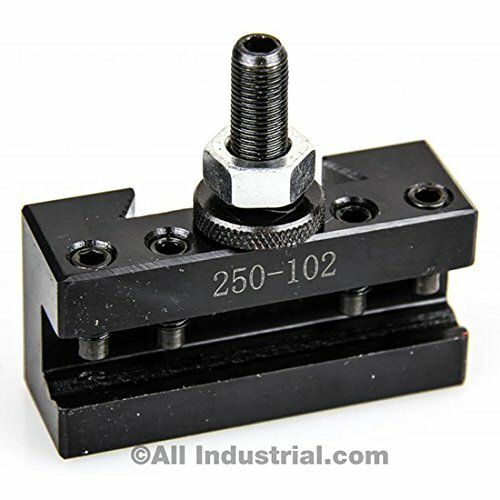 For use with AXA tool post 250-100 or 250-111. up to 12 swing. Precision ground and hardened. Completely sealed for maintenance free operation. Turning and facing tools can be locked together (saving time and labor when changing operations). 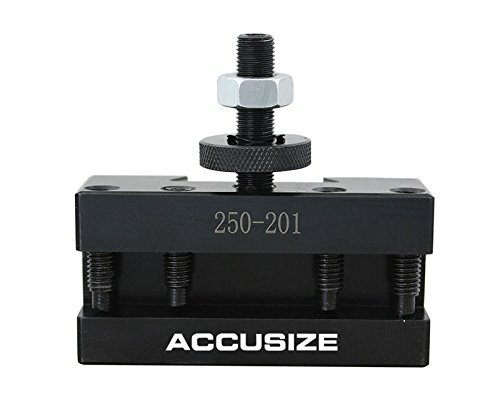 For use with AXA tool posts 250-100 or 250-111. up to 12 swing. Only for use with the Aloris Wedge-Lock Carbide Insert blades, T-type blades or with bevel (wedge-shape) blades having parallel top and bottom edges. For bevel as well as T-type blades. Enables you to cut-off close to chuck. 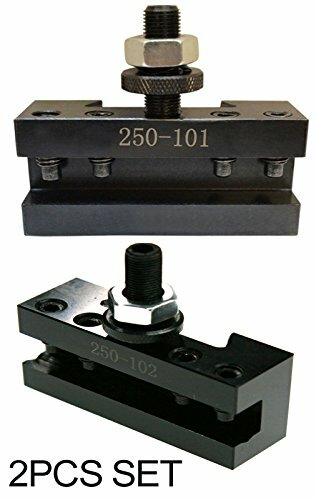 Absence of vibration prevents breaking blades. 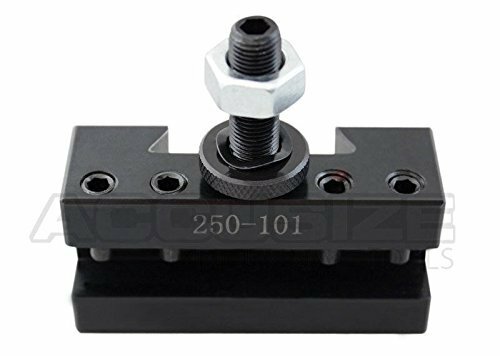 Replacement inserts of this kit , please search the Asin of this item: B07Q2PHVP3 on Amazon to buy it. 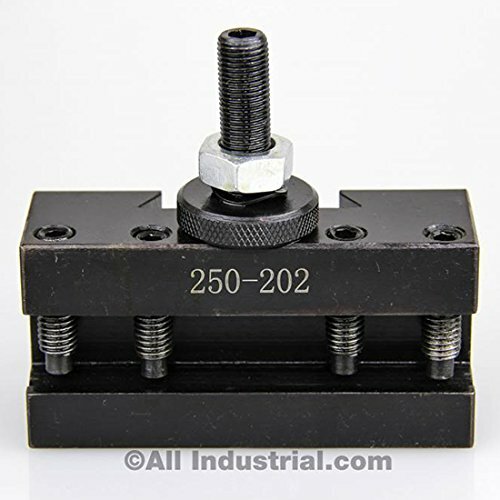 Compact, durable design for vertical or horizontal mounting on work table or tool cart. 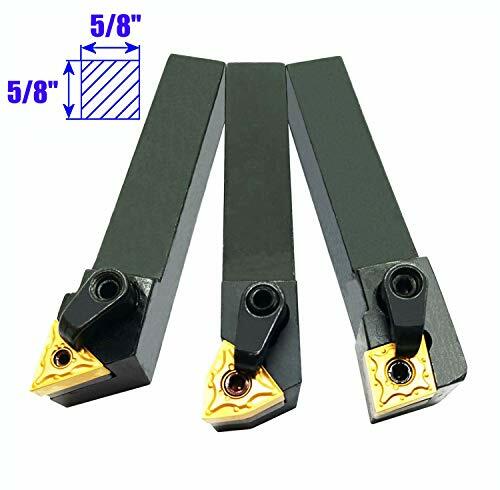 Enables strong gripping power of cutting tools Shipping weight- 13 lbs. 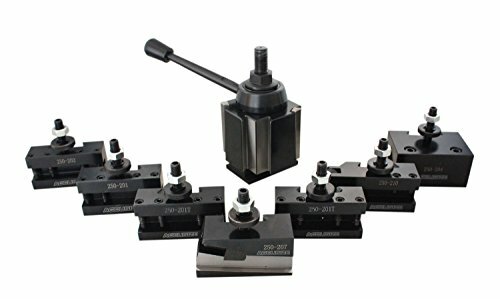 If you need more matching inserts or 5/8" right hand turning holder set, you can search for B07G386Y3B (inserts) or B076WTPBVK (holder) . Style 1: Boring & Facing. Style 2: Boring Turing & Facing. Style 4: Boring, Heavy duty. Style 7: Universal Parting Blades. Style 10: Knurling, Facing & Turning. Lathe Swing: 10-15'' 1 piece of each: 0250-0222, 0250-0201, 0250-0202, 0250-0204, 0250-0207, 0250-0210. 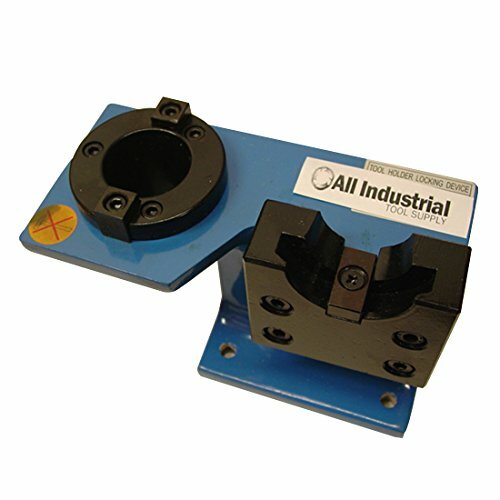 Customer may need to machine the base plate size to fit their lathe. 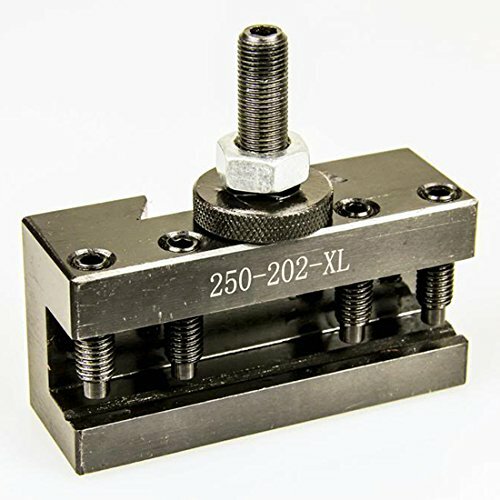 For use with BXA tool posts 250-200 or 250-222. 10-15 swing. 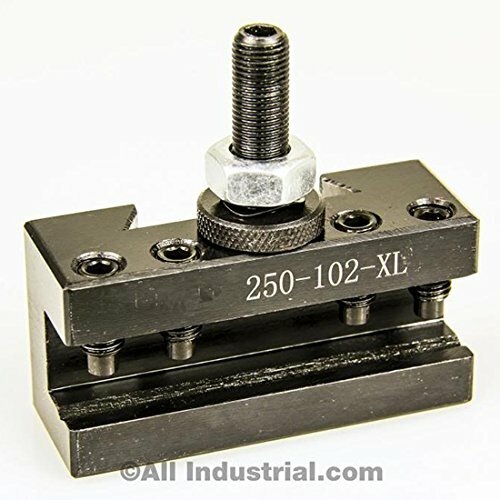 For use with AXA tool post 250-100 or 250-111. up to 12" swing. Turning and facing tools can be locked together (saving time and labor when changing operations). Shipping weight- 1.6 lb. 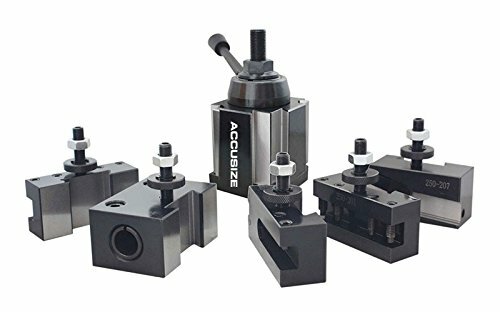 Black oxide smooth finish on each turning tool holder marked with tool holder style and shank size. Each tool holder comes with a C6 TiN Coated carbide insert with positive rake cutting angle and built-in chip breaker great for general purpose cutting action. Insert screw and wrench included. 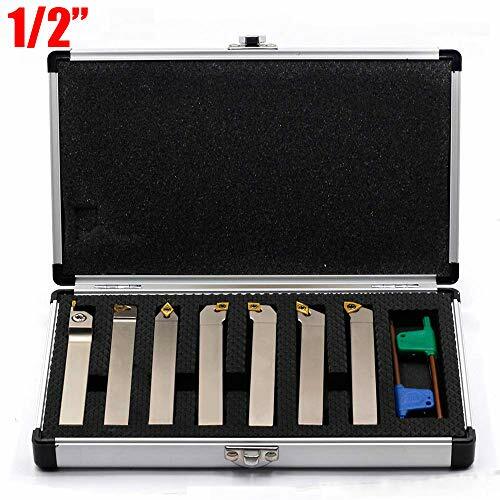 7pcs indexable turning tool holder 7pcs TiN Coated C6 carbide insert 7pcs hex screw. 3pcs hexagon key. 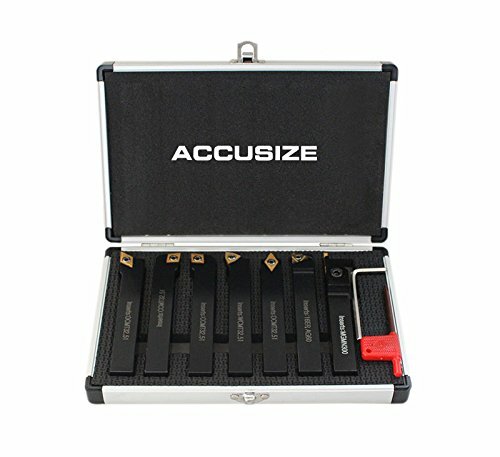 Aluminum fitting case.